It’s spring, but it feels more like summer here already with temps in the upper 80s and low 90s this week. I’m not complaining (not yet, anyway), but it seems like we went straight from winter to summer. One thing I love eating in the summer (or when the temps are warm) is salads. I make a lot of salads. Sometimes as a side with chicken, shrimp, or steak that we grill or for picnics, but most of the time as entrees. I like eating lighter foods during warmer weather and with Suddenly Salad you can add a couple of ingredients and you’ve got a main dish that is light, refreshing, but is satisfying. Recently while I was at Publix I picked up a couple of boxes of Suddenly Salad. They’re so quick and easy to make a delicious side salad or lunch, or add your own ingredients and you have a hearty dinner salad. I made a Classic Suddenly Salad the other day and did the suggested add-ins, since I had grape tomatoes and leftover rotisserie chicken. 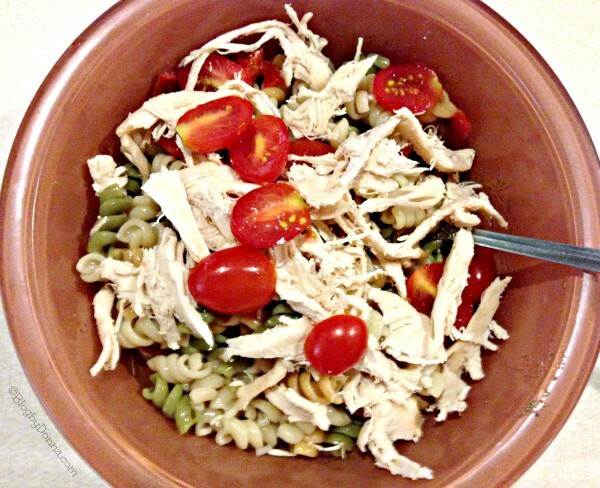 I just used a fork to shred the chicken and slice the grape tomatoes and tossed them into the classic pasta salad. It made a delicious and hearty dinner. I love how easy it is to make and a perfect salad to take on an impromptu picnic… which we do often during the summer. Check out these other Suddenly Salad recipe ideas. 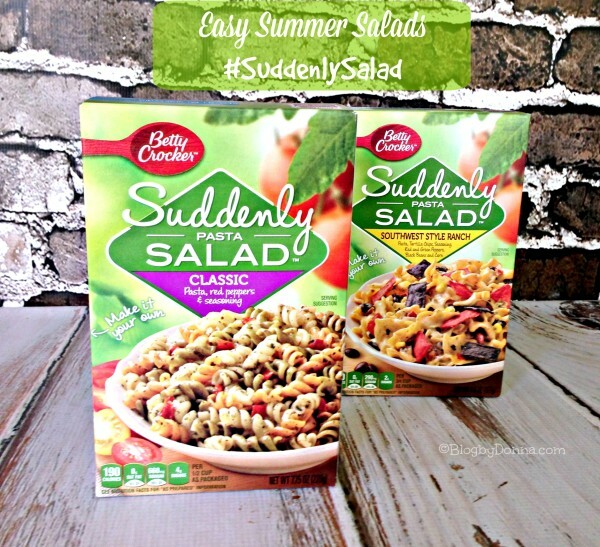 Grab this coupon offer for .50 cents off two boxes of Suddenly Salad at Publix so you can experience a fresh pasta salad for yourself! Suddenly Pasta Salad Classic and Suddenly Pasta Salad Ranch & Bacon are top selling flavors, but feel free to try whichever flavor tickles your fancy! Not only do I have this great Suddenly Salad coupon offer, but I’m giving away $15 cash to one of my Blog by Donna readers! I would totally make and bring the Grilled Caesar Pasta Salad or Layered Mexican Party Salad to any event, or picinic!!! I’m going to make Layered Curry Pasta Salad for my nephews birthday party. Grilled Caesar Pasta Salad for lunch would be awesome! The Grilled Caesar Pasta Salad sounds amazing! I would make the Layered Curry Pasta Salad for a picnic. I would like to try the California Chicken BLT Salad. I would take it to a cook out. Thanks! I will make California Chicken BLT Salad for picnic. They all look great! I would love to make my family the layered curry salad for dinner one summer night! I would make the chicken pesto salad for our annual Memorial Day cookout! I would love the Southwestern Ranch Pasta Salad for a picnic! I would really love to make the California Chicken BLT Salad. It would be perfect for a weekend cookout! The salad recipe I want to try is the California Chicken BLT Salad. The occasion I would make it for is our church picnic potluck. I would make the Chicken Pesto Salad for a backyard BBQ. I want to try the Layered Curry pasta salad for dinner! Oh I would love to make the Quick Antipasto Pasta Salad for lunch or dinner! I want to make the California Chicken BLT Salad for my friends BQQ that is coming up soon. I would make the Tuscan Style Tomato Pasta Salad for cookouts. I would try the southwest ranch pasta salad and bring it to Memorial Day cookout! The California Chicken BLT Salad looks delicious! I want to try the California Chicken BLT Salad recipe, I would make it for a bbq. The sunny broccoli pasta salad sounds good for any night at dinner! I would love to make the Southwestern Ranch pasta salad. It would be great to take to a BBQ or as a side in the summertime. I would make California Chicken BLT Salad for July 4th. I want to try the Chicken Pesto Salad! I would make the Grilled Caesar Pasta Salad at our family get together. That looks so good! 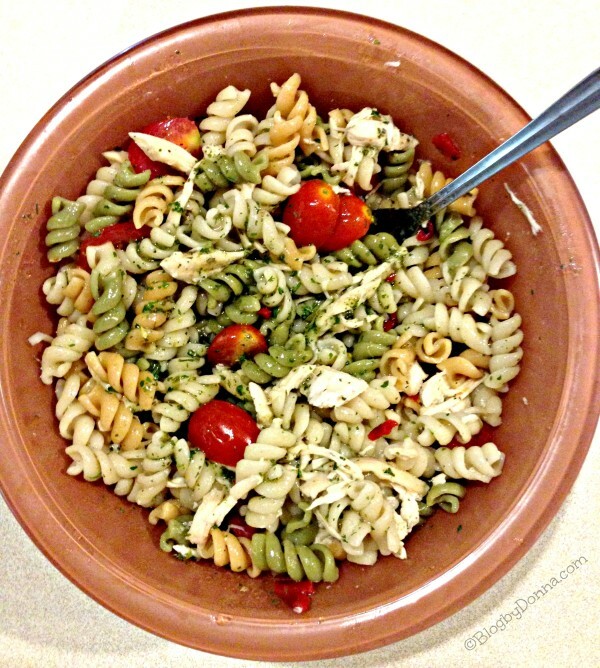 I would love to try the Chicken Pesto Salad while cooking out by the pool with my friends and family! I am going to make the Southwestern Ranch Pasta Salad for our Memorial Day cookout! I would love to make the California Chicken BLT Salad for a memorial day BBQ. I’d make the Layered Mexican Party Salad to take to the next potluck we get invited to. I’d make the SOuthwestern Ranch salad for a cookout. I like the Grilled Caesar Pasta Salad for lunch. I would love yo make the Sunny Brocolli Pasta Salad. I would make it for 4th of July. I would like to make the Layered Mexican Party salad for an upcoming potluck. Oh I just want to eat it all! Grilled Caesar Pasta Salad! I’d definitely make this at a picnic or for a potluck of some sort. Looks delicious! The Southwestern Ranch pasta, and I would make it for a cookout.